SPECTREOUTREACH.com: A 48 US dollar Toothbrush! A 48 US dollar Toothbrush! You never taken Japanese Language Before? How much are you willing to pay in term of money and time to have a great smile. Well! 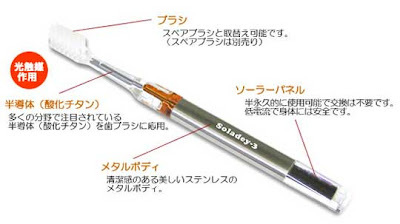 alot for the folk at Japan where "Soladey 3 solar powered ionic toothbrush set" is a must~ have ~thingy to keep all that nasty thing from ruining that multi-millionaire smile into dust and beyond. You all must be thinking how on the HELL why must I pay 48 dollar for a messy toothbrush when I can just a dandy yet reasonable toothbrush less than 1 dollar at Tesco. Ahem! Let see ! It can really "easily removes plaque and cleans teeth by a simple electron reaction". You don't understand? Fine! I try again in a more simplified language! 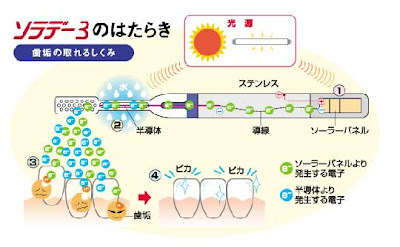 When the light "SUN" thingy be absorbed by the toothbrush metal thingy.It will create an C4 x'plosion effect when brushing. It will NUKE ALL the nasty plague to the point it will fall apart and the end result, your perfect healthy sparkling teeth. 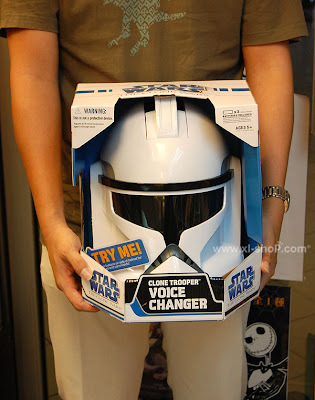 Buy a "CLONE TROOPER VOICE CHANGER" ! teddy: i *loan* the info from some unlucky fella from JAPAN! Wow~~ I always like your blog. So many amazing things I want to buy. Ok.. except that tooth brush too expensive. What to do, tiffany , all *almost* the best thing in life cost a bomb.time to break that piggy bank!